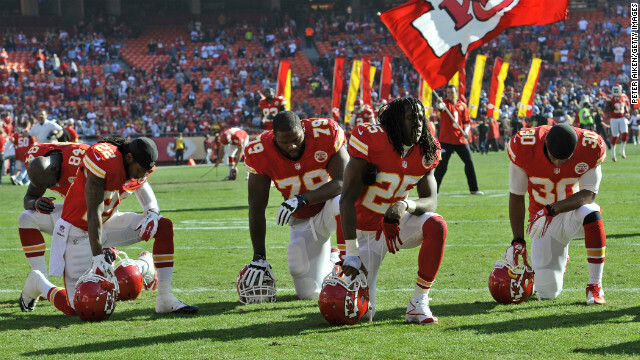 The Kansas City Chiefs kneel and pray before a game against the Carolina Panthers on Sunday, December 2, 2012 at Arrowhead Stadium in Kansas City, Missouri. Natalie Samson wears the No. 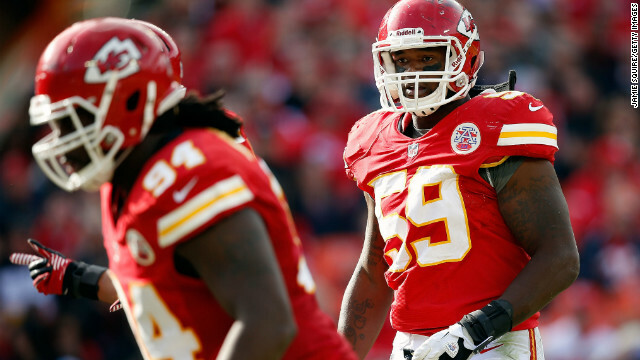 59 jersey, which was Jovan Belcher's number, as she stands for a moment of silence. 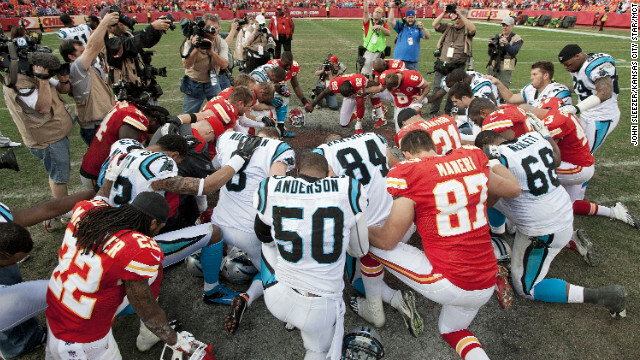 Players from the Kansas City Chiefs and Carolina Panthers gather at midfield for a prayer after the Chiefs' 27-21 win. 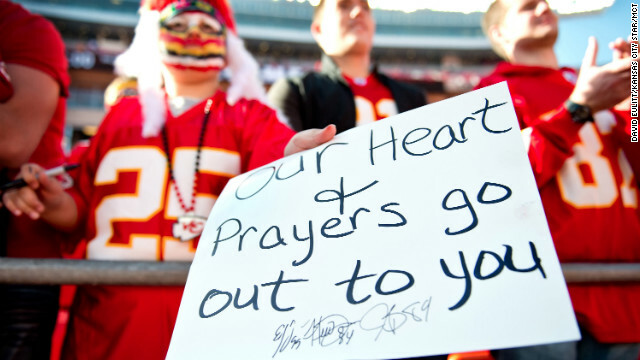 A young fan holds a condolences sign for the Kansas City Chiefs prior to the team's game against the Carolina Panthers. 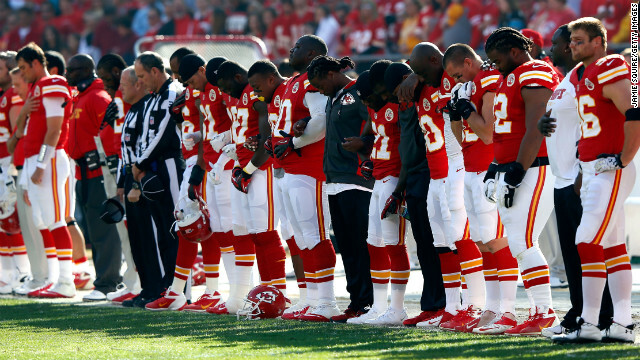 Before their game against the Carolina Pathers, the Kansas City Chiefs pause for a moment of silence. 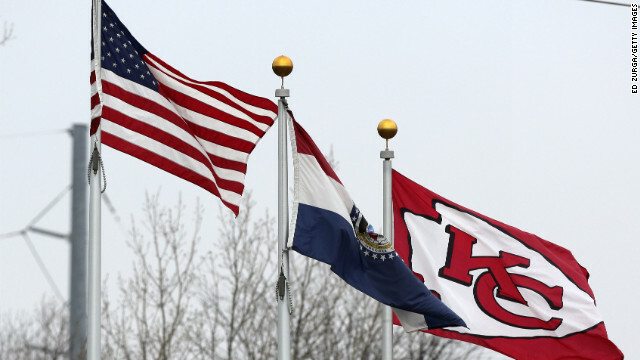 After Belcher and his girlfriend's deaths, flags wave in the wind outside of The University of Kansas Hospital Training Complex used by the Kansas City Chiefs next to Arrowhead Stadium, on Saturday, December 1, 2012. No. 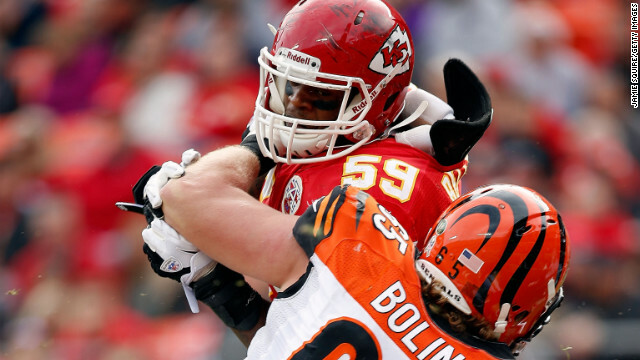 59 Belcher battles guard Clint Boling of the Cincinnati Bengals during the game at Arrowhead Stadium on November 18, 2012 in Kansas City. 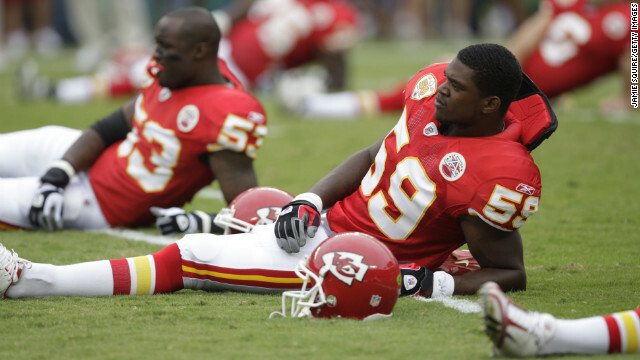 Belcher stretches before the game against the Oakland Raiders at Arrowhead Stadium on September 20, 2009, in Kansas City. 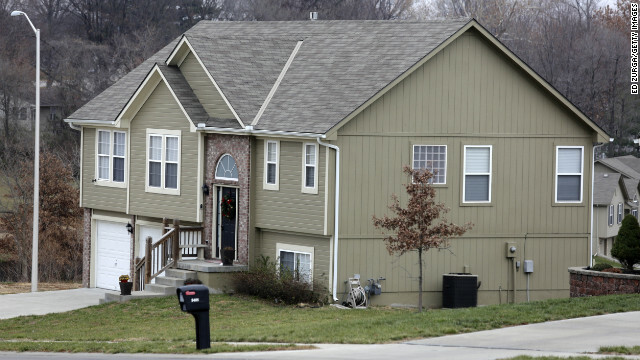 The residence of Kasandra Perkins, Belcher's girlfriend, is seen on December 1, 2012, in Kansas City. Belcher during an NFL game against the Atlanta Falcons on September 9, 2012. Belcher brings down Buffalo Bills running back C.J. 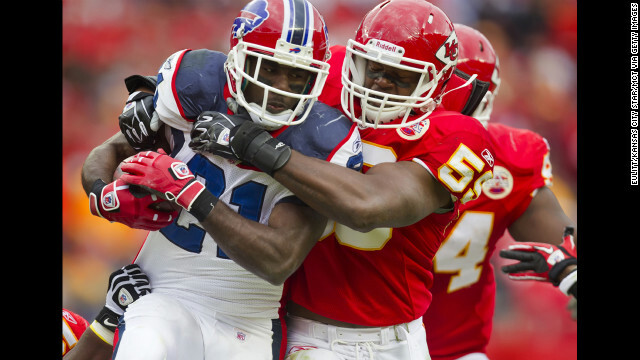 Spiller in the third quarter at Arrowhead Stadium on October 31, 2010. 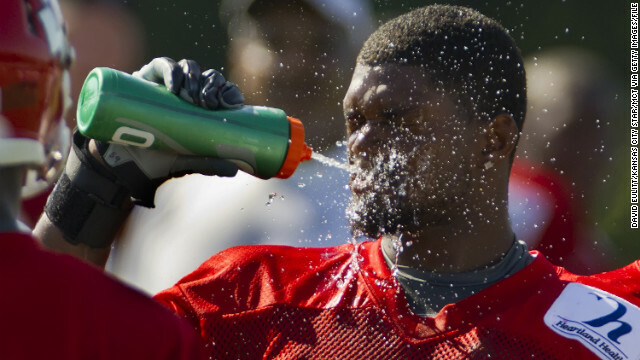 Belcher cools off from temperatures over 100 degrees during a training camp practice on the campus of Missouri Western State University in St. Joseph, Missouri, on August 1, 2011. The linebacker after a game against the Pittsburgh Steelers at Heinz Field on November 12, 2012 in Pittsburgh, Pennsylvania. The Steelers defeated the Chiefs 16-13. Belcher watches from the sidelines during his final game against the Denver Broncos at Arrowhead Stadium on November 25, 2012. Belcher in action during the game against the Cincinnati Bengals at on November 18, 2012, in Kansas City. 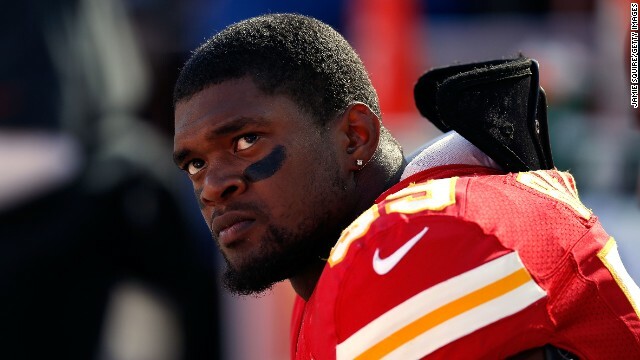 (CNN) -- Readers reacted strongly to a Monday op-ed on CNN.com about Jovan Belcher, the Kansas City Chiefs football player who murdered his girlfriend and then committed suicide. The piece was written by Kevin Powell, an activist, public speaker, and writer, and discussed how the tragedy related to depression and what Powell called "very warped definitions of manhood." It stirred a lot of conversation, including over 1,500 comments and numerous tweets. On Tuesday, Powell will host a live Twitter chat on @CNNOpinion from 12:30 to1 p.m. ET to discuss issues such as domestic violence, depression, gun violence, and the definition of manhood. Please ask questions in advance and join him for the chat by using the hashtag #JovanBelcher and mentioning @CNNOpinion. Here, Powell addresses some of the readers' reactions that he has already received. As men, we must begin to think about manhood in a very different kind of way. I've gotten two distinct responses to my article so far. The first batch is from men who agree that we've got to go in a different direction -- it's unhealthy to squash our true feelings about issues and to never talk. Some men actually admitted to me in very personal and private e-mails that they are hurting right this very minute. Then there were the angry messages from very angry men, accusing me of being anti-men, of male-bashing, of being on the side of women, of not being willing to let a man be a man. Well, my personal definition of manhood is that it should be rooted in self-love and respect for all people, including women. We should view women and girls as the equals of men and boys. And the foundation of manhood needs to be about peace and nonviolence and communication, not anger, hatred, violence and ugliness. chippy1 comments: If he was just a blue collar worker with access to a gun, killed his girlfriend then himself, this story would be back with the comics. Since he was a "great" football player the whole planet goes into a tailspin, just making his victim a footnote. This demonstrates the American attitude towards its "idols," and the American persona, the more violent and bloody and scandal prone, the better. Kasandra Perkins is the victim's name. Let us always say the names of women who are the victims of violence. I would also add it does not matter whether the man is famous, a professional athlete, or someone nobody has ever heard of. Violence against women is unacceptable. However, when it involves a high-profile individual like Belcher, perhaps the tragedy can be a teachable moment so that more people will pay attention to domestic violence. Otherwise Kasandra Perkins' death will truly be in vain. Stay up to date on the latest opinion, analysis and conversations through social media. Join us at Facebook/CNNOpinion and follow us @CNNOpinion on Twitter. We welcome your ideas and comments. Mattias Von Bismark comments: I thank you for this comment. It's a hard thing to say. It subjects you to this slander that you are, somehow, supporting the murder of that poor woman. It takes true courage and strength of character to stand up and say, "Yes, what this man did was awful, but there was something at the root of this tragedy which was unaddressed. If this man had received help, his life and the life of the poor woman would have been saved." Those who have never dealt with mental illness need to keep silent on this subject. As we have seen above, they have nothing helpful to add, and denigrate the serious discussion we should all be having. Mattias, I agree with you. Sadly, many of us do not want to deal with contexts for behaviors or situations. We are quick to name-call and judge and write someone off. The fact is that violence is normal in our country. One-fourth of American women have experienced some form of violence at the hands of men. I always challenge men to talk with their mothers, grandmothers, sisters, aunties, female cousins, or their wives or girlfriends, and they would be surprised to find out how many women have been assaulted in some way at some point in their lives. Just read your local papers, the crime reports, and note the number of attacks on women. 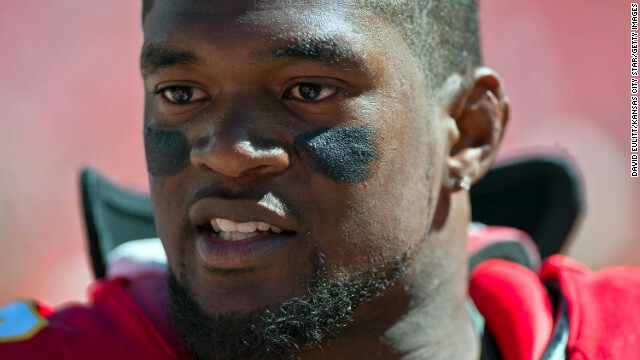 Dissing Jovan Belcher may make you feel good in the short term. But it does nothing to stop this kind of violence. @cnnopinion Sometimes things are THAT simple. 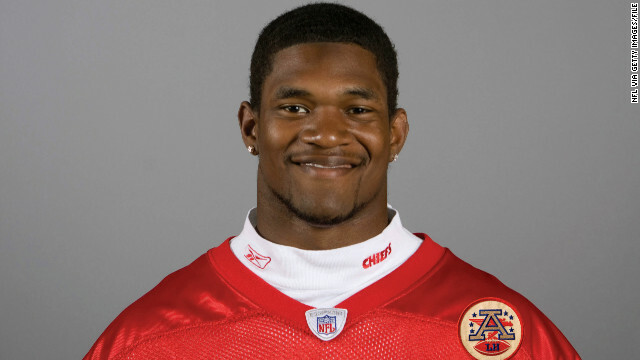 #Jovan Belcher had no right to take this girls life. May he rot in Hades; thou shalt not kill. Dana, I understand completely your feelings. Do I condemn violence? Absolutely. But am I in position to determine who is going to heaven or hell? No. I am Christian. I just think we've got to be careful of passing judgment on anyone at any given time. Kyle Jarvis Chan Wu comments: I get the idea that you are actually sticking up for someone who murdered his wife. He shot her. That is a fact. I don't need to stand in the shoes of someone who would act violently against a woman. There is a difference between someone who takes their own life to depression and someone who goes on a killing spree ending with their own life. One person needs help, the other person doesn't deserve a marker on their grave. Kyle, that is absolutely untrue. I do not condone violence, and I hope for peace and love toward all. But as someone who has overcome personal challenges in grappling with violence and anger, I know that there are some serious issues around manhood and mental illness that we are not fully addressing as a nation. We need to start talking about how to help those in need. @cnnopinion @kevin_powell sad thing is, to the media a woman's life has very little meaning. It's all about the men. 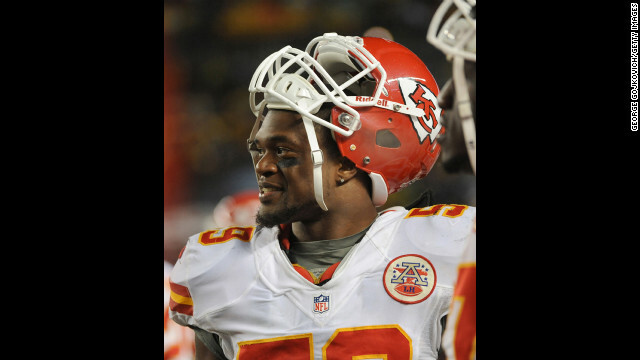 Desiree, that is why we must not forget Kasandra Perkins, Jovan Belcher's girlfriend. I'm not a woman but I can certainly empathize with what women and girls deal with every single day of their lives. I can only imagine. Sexism is alive and well, and the fact that Ms. Parker's name is barely mentioned in most media outlets means that there's a lot of work we need to do to change this situation. AB comments: the entire story is horribly sad, BUT why was there a moment of silence for him? he murdered his child's mother, and then, killed himself, leaving a baby with no mother or father. ... He murdered someone and you are giving him a moment of silence? If that was my daughter, it would make me more than angry if you gave her murderer this.. everyone is saying he was a great guy, well this great guy, did a horrendous crime. That is incorrect. 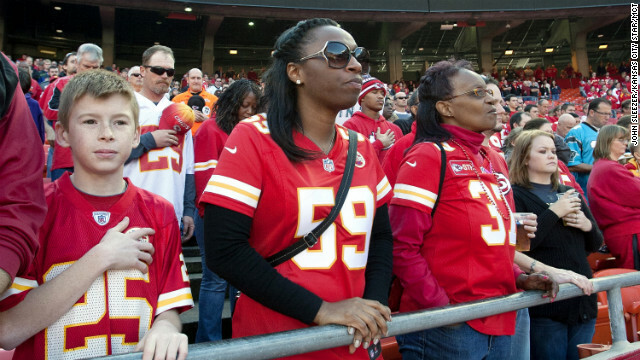 There was actually a moment of silence by the Kansas City Chiefs for victims of domestic violence, as it should have been. My hope is that the National Football League, as well as other sports leagues, will take the same kind of very visible stance on domestic violence as it has on breast cancer. Interested in talking with the author, Kevin Powell? Join him for a live chat about his column on Twitter from 12:30 to 1 p.m. ET on Tuesday @CNNOpinion. Tweet your questions or comments by using the hashtag #JovanBelcher and mentioning @CNNOpinion. The opinions expressed in this commentary are solely those of Kevin Powell.